Music theory covering Notes, Key Signatures, Intervals, Chords, and Rhythms, that tests basic musicianship at an advanced level. Includes a 'Grade Book' list of all saved test results that you can edit and share as a pdf to print or email. 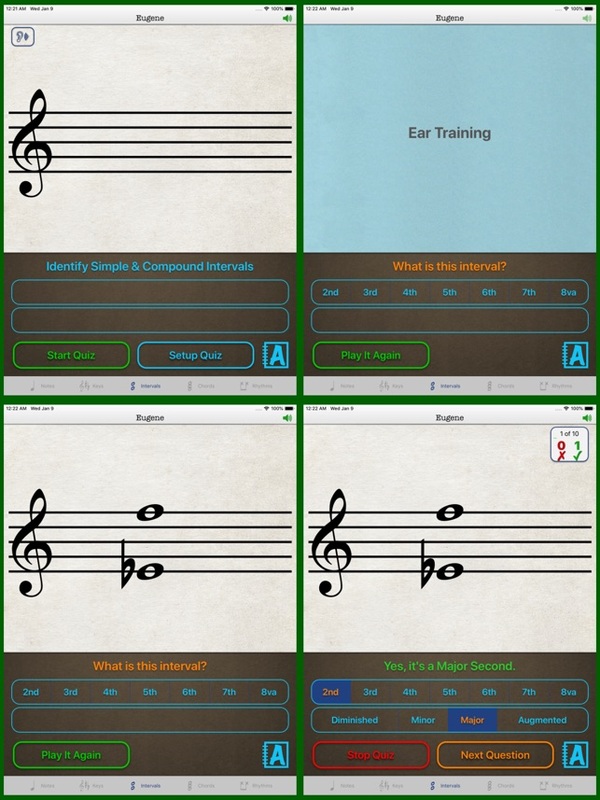 • Notes, Intervals and Chords include an Ear Training mode that quizzes by audio only, while Rhythms is customizable from easy to nearly impossible. 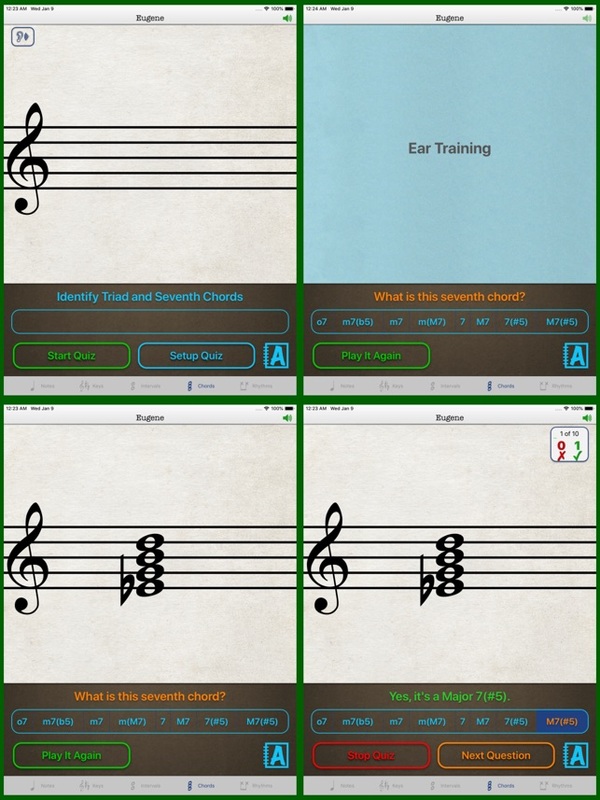 • All pitched quizzes support Treble, Alto, Tenor and Bass clefs. • Interval and chord roots can be random or user set for each question. • Set a specific number of questions, with up to three attempts, or stop anytime and grade only the number answered. • An optional timer records the time it takes to finish the quiz. 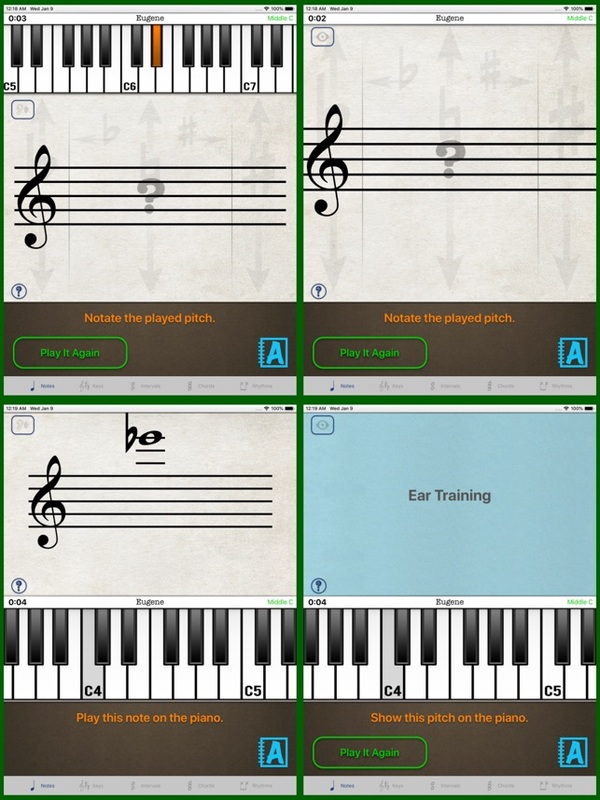 Notes module tests music notation and piano keyboard knowledge. 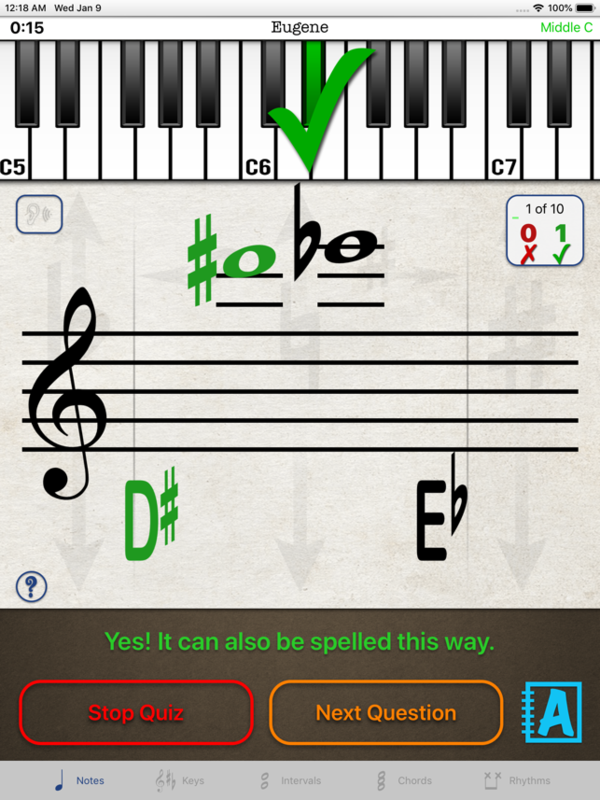 Key Signatures covers major and minor keys as well as the seven diatonic modes. 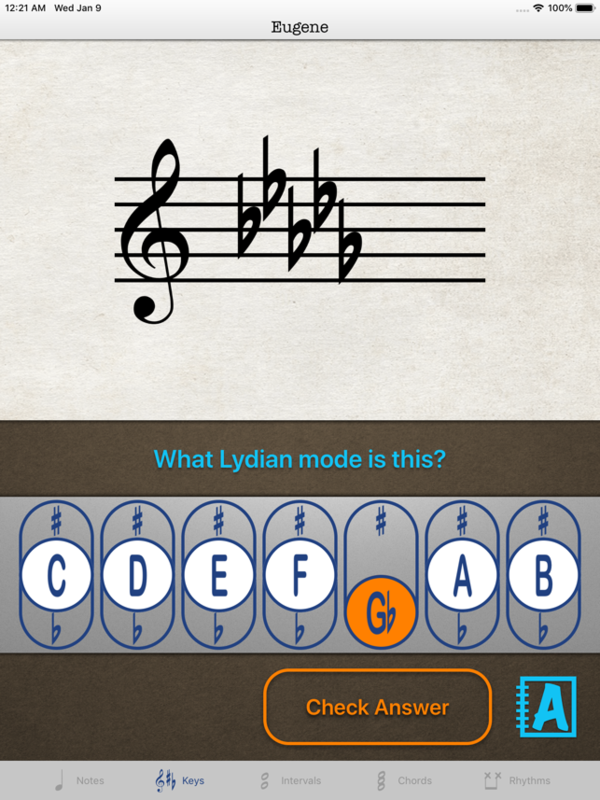 Set separate maximum number of sharps or flats for the quiz. Intervals includes simple and compound intervals played harmonically, melodically up or down. Intervals covered are major, minor, diminished, augmented 2nds, 3rds, 6ths, 7ths, and diminished, perfect, and augmented 4ths, 5ths, and octaves. Chords include triads and seventh chords played harmonically, melodically up, down or randomly. Triads are major, minor diminished and augmented. Seventh Chords are dim7, min7(b5), min7, min(maj7), dominant7, maj7, dominant7(#5), maj7(#5). 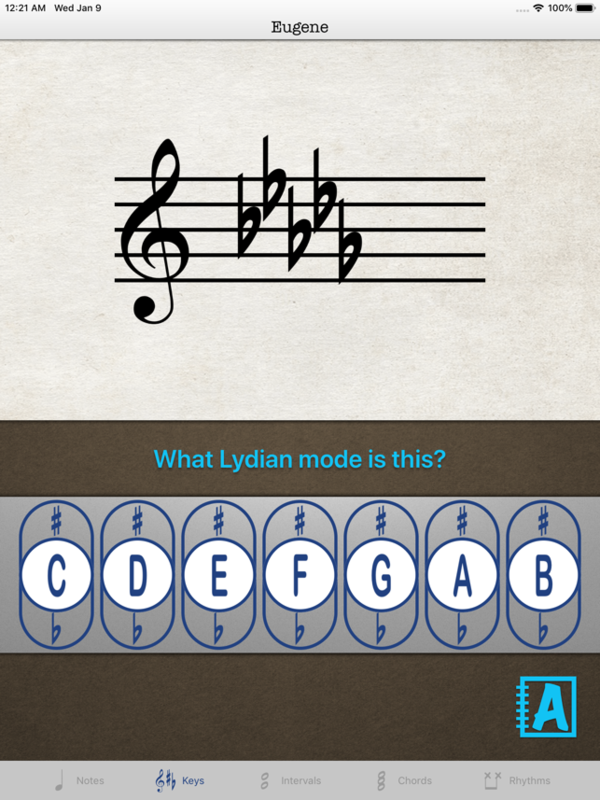 Rhythms tests your rhythmic and polyrhythmic skills. Develop hand independence with two lines of rhythms. 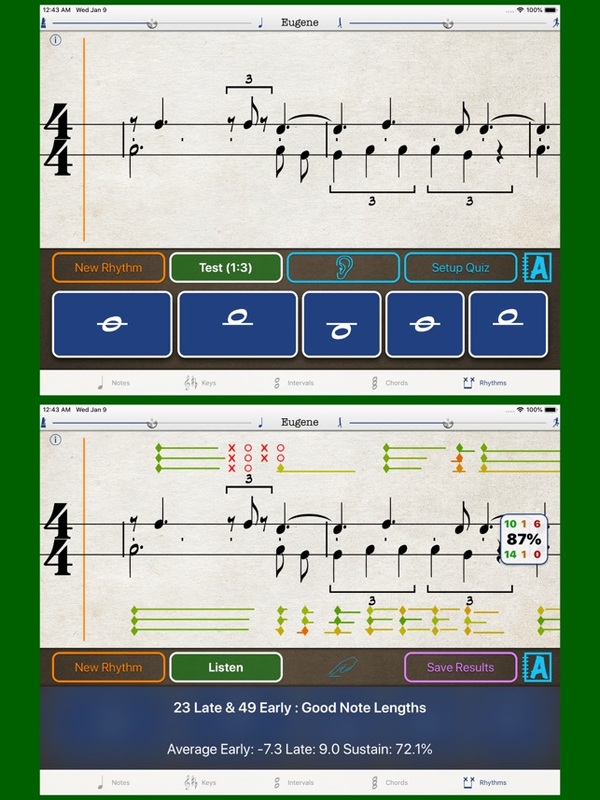 - Customizable options include; up to 16 measures in 2/4, 3/4, 4/4 or 5/4, one or two lines of rhythms, each with up to 3 pads (pitches), include specific note/rest values, and exclude grading durations (primarily for percussionists). - Included note/rest values: Whole, Half, Quarter, Eighth, Dotted Half, Dotted Quarter, Triplet Half, Triplet Quarter, and Triplet Eighth. The Grade Book is filterable by student name. Access to the list can be password protected by entering a password in the Settings app. Grades include the student's name, date and time the quiz was taken, all relevant quiz settings (clef, number of questions, etc. ), and score (percentage and letter grade). Major update for compatibility and functionality. © 2009 - 2019 Patrick Q. Kelly. All Rights Reserved.